It is not just nail art, it is art. It has been awhile since my last nail art quote. But the one I am sharing with you all today came from a friend, a male friend. We were having a chat in Facebook regarding my Gilas Pilipinas (Basketball) Nail Art and he mentioned that he particularly liked it. I don't usually receive nail art compliments from guys. So it was surprising, for me at least. It was during our conversation that he mentioned the statement that I quoted in the picture. It was an opinion that I myself believe. I feel sad that the majority of people I meet easily disregard nail art as something unimportant. Although they are entitled to feel that way, I would like to point out that it is worth taking seriously because it is art. People attend art galleries and admire artists who created those masterpieces hanging on the wall. How is that different to painting nail art? Nail artists create masterpieces as well. We do not hang our pieces on the wall nor do we showcase them on galleries because we wear them on our/clients' nails. But it doesn't diminish it's art value. Perhaps the culprit is the bias some people have that nail art is tacky. But that depends on your personal preference. Like fashion, there will always be styles that you cannot see yourself wearing simply because it is not your taste. It applies to nail art as well. You just have to find the design or style that suits your personality. However, I do understand that nail art is not for everyone. What I am simply asking is for people not to look down upon this special kind of art. 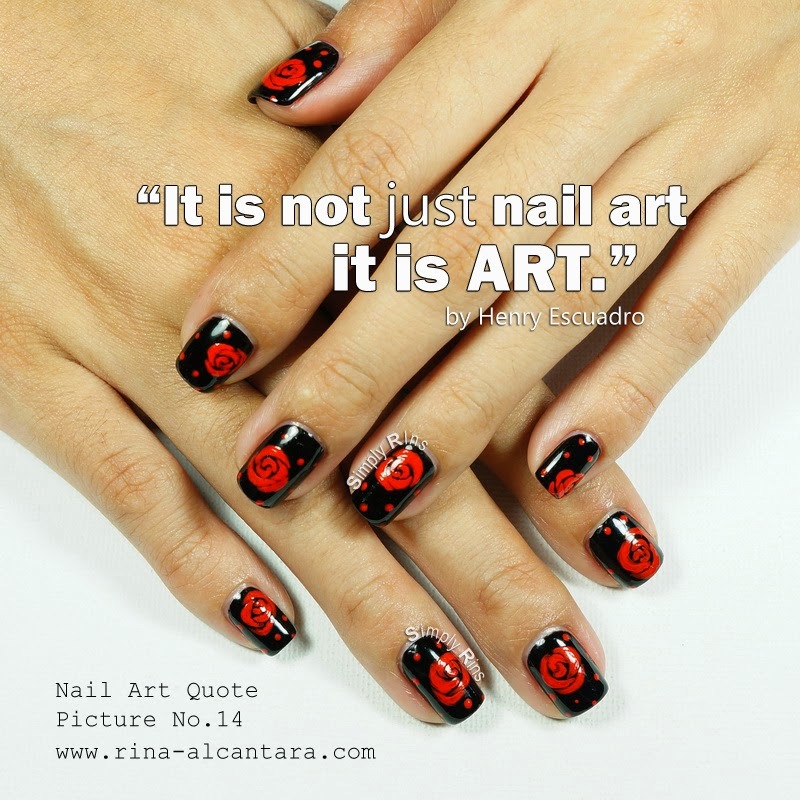 Nail art used in photo is Red Roses on Black, one of my early designs way back on 2012. My husband draws comic book art and always takes an interest in my nail art and in ones I show him because of the art. I just loved your nail art and the perfection you have in this nail art is super amazing, I mean if you really now the art and have good skills in that than you will be able to do this work perfectly.